Donald Trump finally got the (equal) treatment he deserves. 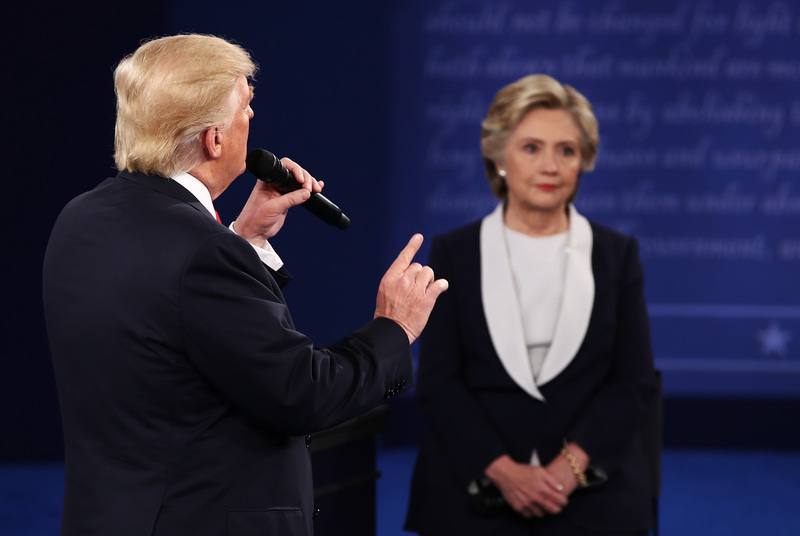 During the blistering spectacle that was the second presidential debate, Trump interrupted Hillary Clinton nearly 20 times. He complained to co-moderators Anderson Cooper and Martha Raddatz that Clinton received more time to respond to questions, and spent much of the debate chastising the moderators for apparently favoring the Democratic nominee. But did Clinton really receive more time to speak than Trump? No. Trump just got his first dose of equal treatment in his lifetime. And apparently, he couldn't handle it. According to CNN Politics, Trump spoke for 40 minutes, 10 seconds during the second presidential debate. Meanwhile, Clinton spoke for 39 minutes, five seconds. The amount of time both candidates received to answer questions and pitch their respective platforms was more or less equal. This is what's known as fair, or equal, treatment. For Trump, it was painful. It's honestly pretty astounding that Raddatz and Cooper were able to rein in Sunday night's fiery theatrics to ensure that both candidates had the same opportunity to respond to the questions. The two moderators had to remind Trump again and again that Clinton silently sat back and let him answer. The billionaire businessman was cutting and defiant. Already visibly tense at the start of the debate, Trump grew more heated as the minutes flew by. Trump even began attacking the moderators. "Why don't you interrupt her?" Trump snapped at Raddatz. At one point, Trump commented that the debate felt like "one on three." The 69-year-old businessman continued to act like a little kid throwing a tantrum in a grocery store, growing progressively louder and redder while trying to (hilariously) overtake the stage by hovering over Clinton as she spoke. It's clear that Trump wasn't upset solely by the interruptions — he couldn't handle the constant pushback he received from Raddatz and Cooper. Both journalists always seemed to have a follow-up question for the Republican candidate. For instance, Trump doled out that snarky remark to Raddatz after the ABC News journalist interrogated his proposed temporary ban on Muslim immigration. Earlier in the debate, Cooper pressed Trump on the newly surfaced video exposing Trump's comments about sexually assaulting and harassing women. Trump espoused a jumble of classic Trumpisms, from ISIS to "No one respects women more than I do." When Cooper reminded Trump to stay on topic and address the initial question, Trump asked: "[Clinton] is allowed to do that, but I’m not?" Trump not only received the same amount of time as Clinton, but was also held to the same standard of credibility and accountability. Women politicians — or all women in the public eye, really — know all too well that every word they say and action they take is heavily scrutinized; nothing goes unnoticed, no word goes unheard. Women politicians know they have to show up with the receipts, because they will be asked for them. Welcome to equal treatment, Donald Trump. It's a whole new world for you.